Follow the LGBTQ+ Resource Center on Instagram - @dsu_lgbtqcenter for the latest news and events! LGBTQSA (club) meetings will resume 1/29/19 - Tuesdays 3-4pm in Holland #477. 7- PFLAG Meeting 7pm - 823 Harrison Dr. St. George, UT 84790. Call 435-313-3366 for more info. 10 - LGBTQ+ Support Group Meeting - Health and Counseling Center 3:30-4:30pm (1037 E 100 S before U-plaza). Meet at the Resource Center by 3:15pm if you want to walk over with a group. 16 & 17 - Club Rush. Diagonal Lawn 9am-1pm. 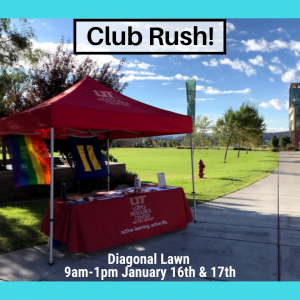 Find out what clubs are offered on campus and sign up! Stop by when you can. Free snacks and giveaways. 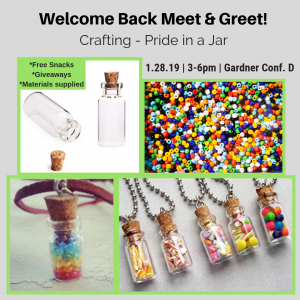 Crafting event making "pride in a jar". presidency team! The club will meet every Tuesday from 3-4pm in Holland #477. 7 - LGBTQ+ Support Group Meeting - Health and Counseling Center 3:45-4:45pm (1037 E 100 S before U-plaza).